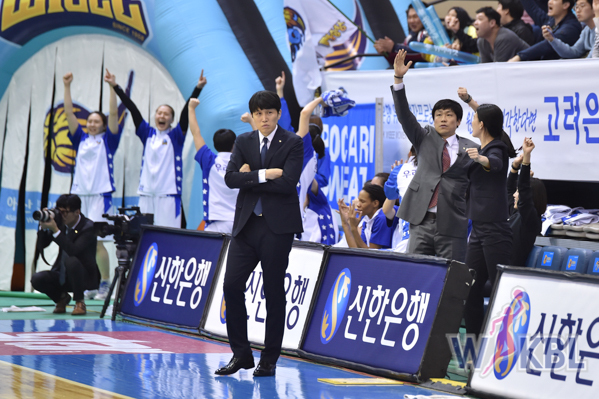 Woori Bank celebrates during the second half of the WKBL Finals. The Korean League kicked off their best of five finals series on Thursday night. Samsung, who made it out of the semi-finals by beating KB Stars in two games, were up against Korean League regular season champions Woori Bank. Woori Bank hadn’t played a game since March 6th as they awaited the winner of the semi-finals. The first quarter went back and forth as Woori hung onto a one point lead going into the second. Woori tried to create some space between the two but Alyssa Thomas and Kimberly Han kept Samsung close. Woori took a five point lead into the half. The second half showed why Woori has been so successful this season as they slowly built a lead in the third. Up by 10 to start the fourth, led by Lin Young Hee and Park Hye Jin, Woori held onto an eight point victory. The finals have a quick turnaround as game two will be played on Saturday. There won’t be much rest for Samsung players as four of their five starters all played over thirty minutes. Alyssa Thomas and Park Hana played forty minutes. Woori only saw one player play the entire game.